Tools/parts Required: Soldering iron. 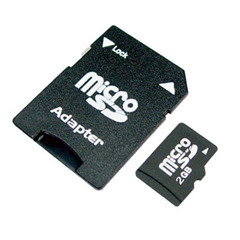 Micro SD card and SD adapter. I won't really go into detail because there are 50 other pages out there for how to add an SD card. Mine is a little different in that I soldered the wires directly to a Micro SD card adapter which allows you to use a Micro SD card as a removable disk. 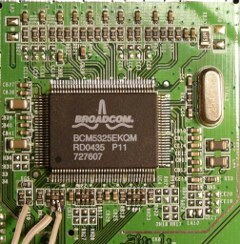 I started with a 2GB micro card and realized I didn't need anywhere near that much space so I am currently running a 256MB micro card. Once I found the appropriate GPIO pins on my board I ripped off a chunk of old IDE cable and soldered one end to the GPIOs (tricky) and the other end to the appropriate contacts on the Micro SD adapter. I then glued the card to the top of the switch and cut a hole out of the back of the case for it to stick out. I currently have the root filesystem on SD card. 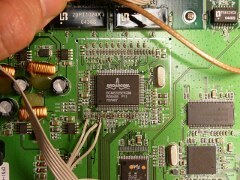 I used GPIO pins 3, 4, 5, and 7, along with 3.3 volt and ground for a total of 6 wires needed to solder. Pick GPIO 7 up off the DMZ LED and power and ground from the serial port header. 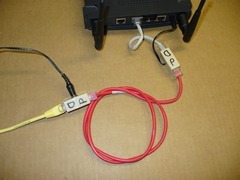 If you want more help or have any questions you can ask in the forums at www.openwrt.org and I would be happy to help. 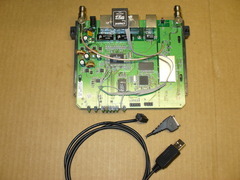 Lot of good info on this OpenWrt page.